The Lowdown: Good intentions to convey an important message about the PTSD suffered by combat veterans clashes with first-time director Jason Hall’s amorphous narrative. 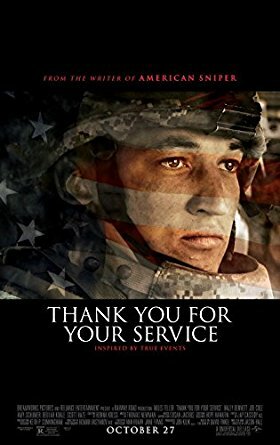 Good intentions dominate writer-director Jason Hall’s Thank You For Your Service. Based on journalist David Finkel’s non-fiction volume of the same name, the film works hard to expose difficult, tragic realities of the PTSD suffered by so many returning combat soldiers. There is a need to tread lightly here while describing Thank You‘s shortcomings as a film—the message itself is important, thought provoking, and well worth hearing. The problems lie in Hall’s failure to sustain narrative cohesion. He’s no stranger to the modern war film genre, having received an Academy Award nomination for his adaptation of the late Chris Kyle’s memoir American Sniper. But that film had the sure directorial hand of Clint Eastwood behind it, whereas Thank You is Hall’s directorial debut. 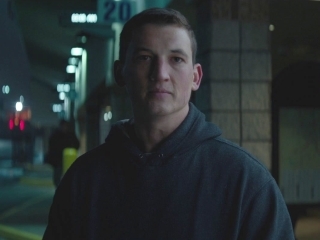 At the center of his story is Staff Sergeant Adam Schumann (Miles Teller), who returns to his Kansas home after a grueling 15-month deployment in Iraq. Struggling with debilitating guilt over his role in the fate of some of his fellow soldiers, Schumann wrestles with VA paperwork as he seeks mental health treatment. Wife Saskia (Haley Bennett) puts on a brave face, but she’s confused by her husband’s current state of mind. The usually vivid Teller comes across as alarmingly tentative in the role, as if he isn’t quite sure who Schumann—specifically Hall’s version of Schumann—is supposed to be. Beulah Koale has a showier (and better defined) role as Specialist Tausolo Aieti, not only dealing with severe PTSD but also a traumatic brain injury. He too is caught up in the VA bureaucracy, made worse by attempts to self medicate with recreational drugs. However his story arc devolves into corniness as Aieti begins working for a local gang member—leading to an overly convenient, pat conclusion that’s too simple to be emotionally or intellectually effective. The true heart of Thank You For Your Service lies in the relationship between Schumann and Michael Adam Emory (Scott Haze), the friend whose life Schumann believes he ruined during an accidental incident in the heat of a combat operation. Haze handily steals the picture with quite limited screen time, searing the screen with a portrait of genuine carpe diem vitality in the face of adversity. Yet Hall botches the key moment between Schumann and Emory—he doesn’t mine the true emotion in what is meant to represent Schumann’s unburdening, or at least one part of it. Hall also manages to leave Schumann’s other key unresolved relationship, with that of a fallen soldier’s wife (Amy Schumer), as limp as a wet blanket. Schumer’s warts-and-all portrayal of Amanda is brave, but she’s given almost nothing to work with. As Schumann attempts to come to terms with his role in her husband’s death, Amanda manages to come across as little more than annoyed. Maybe Schumer’s inexperience as a dramatic actress is partially to blame for the lack of gravitas, but Hall’s banal dialogue is certainly a key factor. Thank You For Your Service is graced by moments of emotional intensity, but ultimately fall short of the cathartic experience it might’ve been under the stewardship of an experienced director.